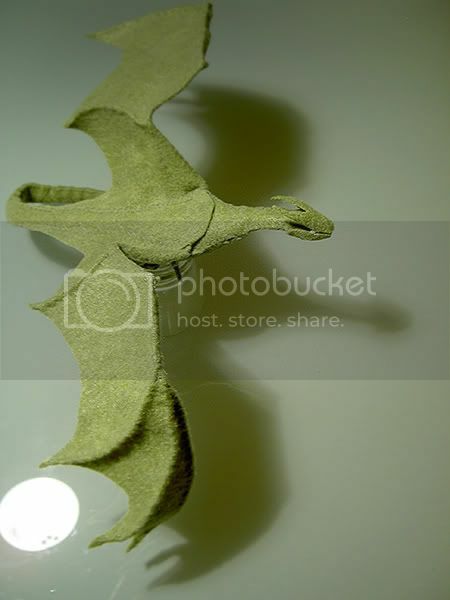 A little over a year ago, I made my first dragon, based on the dragons from the movie Reign of Fire. It was the second plush I'd ever made, and also my first without a pattern. Since then, I've learned a lot about making plush toys, and as much as I love my blue dragon, the process needed a little cleanup. Design-wise, as in the overall way he's put together, he didn't need changing. I just wanted to see if I could come up with a more polished version. I've been working on this guy, off and on, for the last few weeks. The new boy's in olive green (a slightly darker shade in RL than in the photos), which is the color I intended my original dragon to be. I only went with the deep royal blue because at the time I thought I'd have to color-match it to a second material, only to discover as I was putting the dragon together that I didn't need the other material after all. And the blue turned out gorgeous, anyway. But now that I was going to make a second one, why not give the original color a shot? I know some people were interested in a pattern, but I wasn't able to work out all the design issues until now. One of the things I wanted to get away from in the new pattern was having to turn and stuff that long, slender neck and tail. How on earth I was ever able to manage a turn-and-stuff on my blue with a) thicker felt and b) virtually no experience, I'll never know, because by using similar pattern pieces it was impossible to replicate it. I can only chalk it up to beginner's luck. I was going to give the eye a reddish cast, as I did with the first dragon, but fell in love with this milky opal effect instead. It has an intense sparkle that completely does not translate through the lens, no matter how many times I photographed it. Here he is demonstrating how he'd swoop down on prey. Well, as long as he doesn't do it to me while I'm sleeping. ...or spread them out and look up. You can see his tail coiled around the glass in the top photo above. "Enough pictures, human. Where's my dinner?" Uh, well, I don't want to be responsible for his kind laying siege to the planet, so I guess we'll stop there then. That is absolutely amazing. Incredible. Is he really as tiny as he looks? Because I can't imagine sewing something that tiny. I love that he is pose-able! Let me tell you, if you made a pattern available for this, I would love you forever. I just have to say, AWESOME! Check out my store, Portrait of a Penguin! Learn the history of the ancient penguins! Come check out my blog, Geek Central Station! Your little fella looks awesome!! 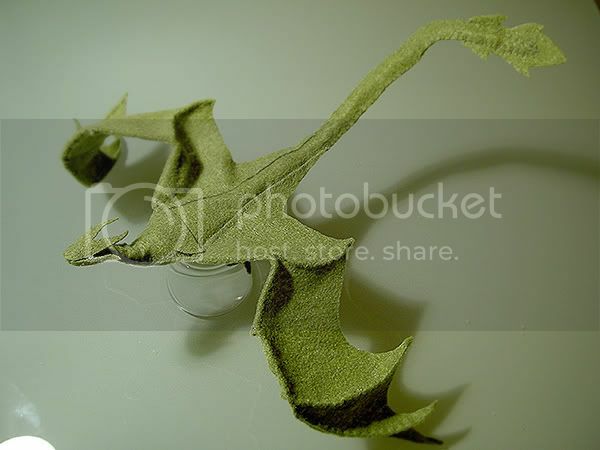 I have to ask, did you use wire or pipe cleaners/chenille stems in the dragons? 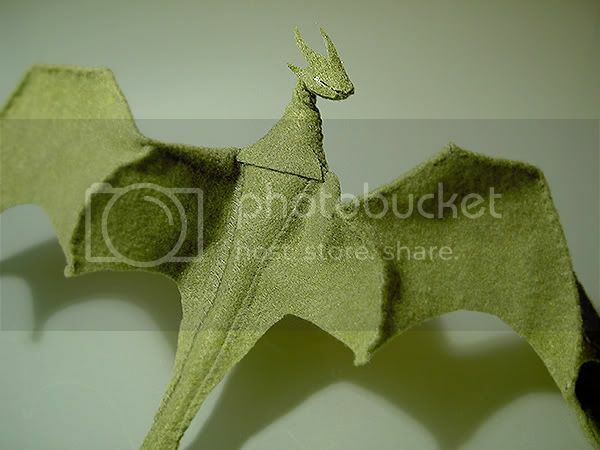 I am just really fascinated with the construction - I would never have thought that the wings and head could have come out that amazingly detailed in felt. Love the last shot and comments. Ooh, ooh, ooh! Does this mean you're making one for us? Pretty please? I'm now dying of anticipation! Christmas gifts be darned, they can wait to be finished until I create one of these to love! 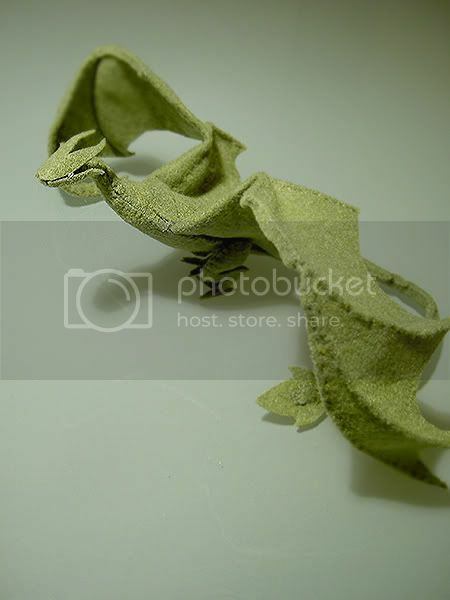 Okay, I'll try to stop gushing now - I've loved dragons since I was very young, and seeing a shoulder-sized dragon (albeit in felt) just makes me all kinds of happy. You really should get a shot of him with his tail wrapped around your hand like the blue dragon. Thanks again for sharing! That is absolutely stunning! 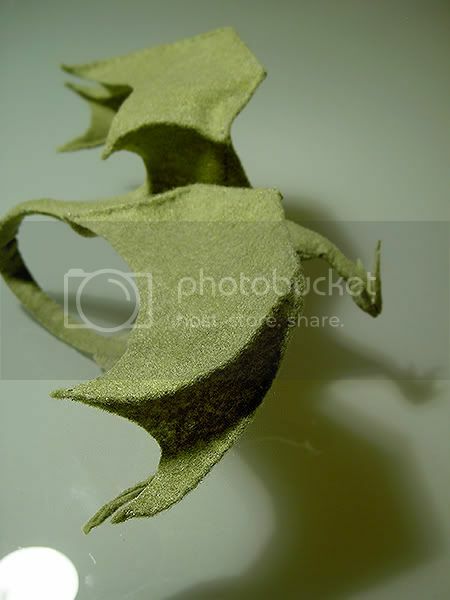 Such a detailed little dragon! 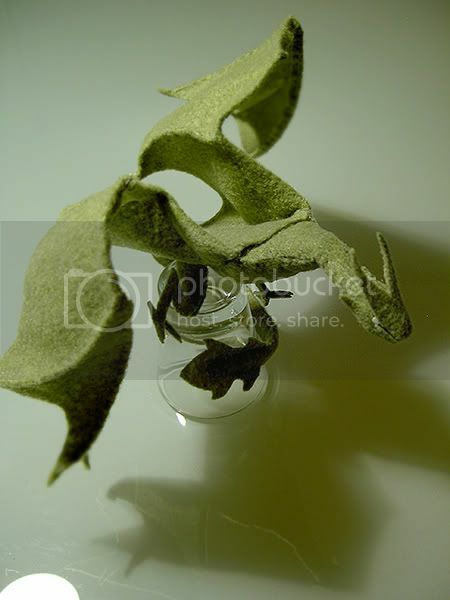 I don't think I could ever make one like this! Thanks everyone! The computer I'm using (not mine) is acting up so I'll respond in more detail later. Is he really as tiny as he looks? Because I can't imagine sewing something that tiny. Yes, he's quite tiny. I'm not at home so I can't measure, but just to give you some idea, that's a shotglass he's perched on. Oh wow, he is beautiful! I love the shape of the face, well done! !